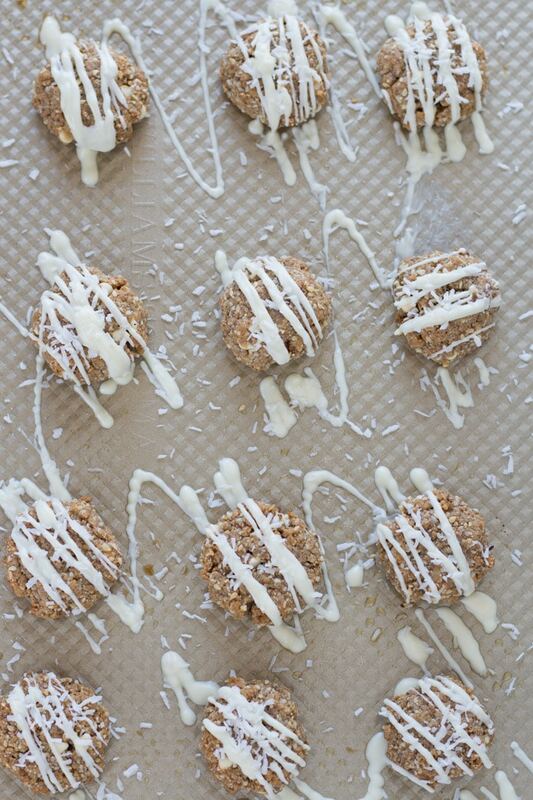 Pineapple Coconut Energy Bites with white chocolate and macadamia nuts! You need to bake up a batch of these tropical clean eating cookies to accompany you on your travels this summer! I’m going to admit that I have a bit of an addiction to energy bites these days. What’s not to like? They are quick, easy, clean eating, and full of tasty energizing ingredients! And best of all, they are portable! Perfect for an on-the-go snack or even breakfast (although I would definitely pair this with some fruit if I was eating it for breakfast). 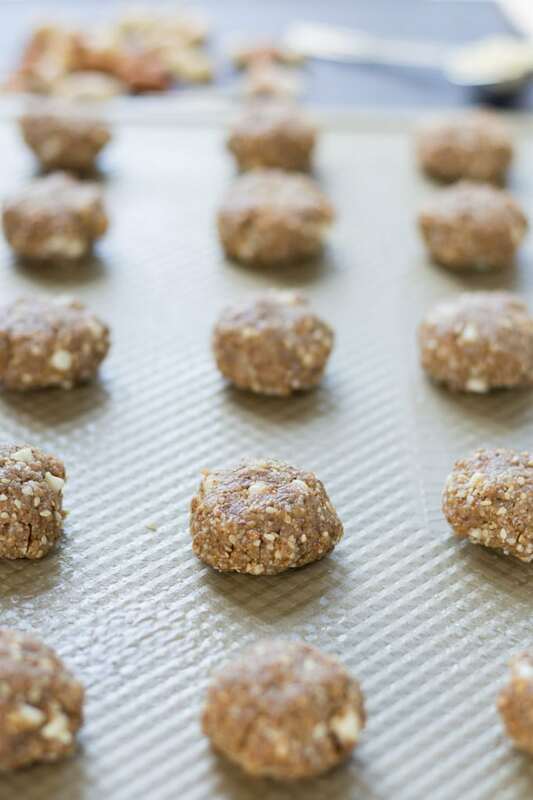 My desire for a portable snack is the reason I whipped up a batch of these Pineapple Coconut Energy Bites a few weeks ago. I wanted the perfect travel snack I could stuff in my carry on! I just returned from a week in Toronto, where I was joined by my two best girlfriends (we’ve known each other for over 30 years!) for a 4 day girls trip that included great food, shopping, lots of laughter, Niagara on the Lake (hello wine!) and a New Kids on the Block concert. Yup! NKOTB! My inner 12-year-old was in her glee! It was a jam-packed 4 days, and so much fun 🙂 . But my vacation didn’t end there! My husband then joined me in Toronto for 3 days in which we enjoyed more great food, plenty of craft beer and a U2 concert! What can I say? It was an awesome week……and explains why this blog post is a little late coming! But back to my reason for talking about TO, which are these Pineapple Coconut Energy Bites! I usually pack snacks when I travel…..fruit, almonds, Lara Bars…..if we get delayed (which happened this time! ), I’ve got myself and my travelling companions covered for snacks! So naturally, as the trip approached, I thought energy bites would be a great addition to my clean eating treasure trove of carry on snacks. While I enjoy these Chocolate Hazelnut Energy Bites, I think they taste best right out of the refrigerator. At room temperature for too long, they get a bit soft. So I wanted to make a baked energy bite that would store and transport easily and wouldn’t require refrigeration. Enter these Pineapple Coconut Energy Bites. 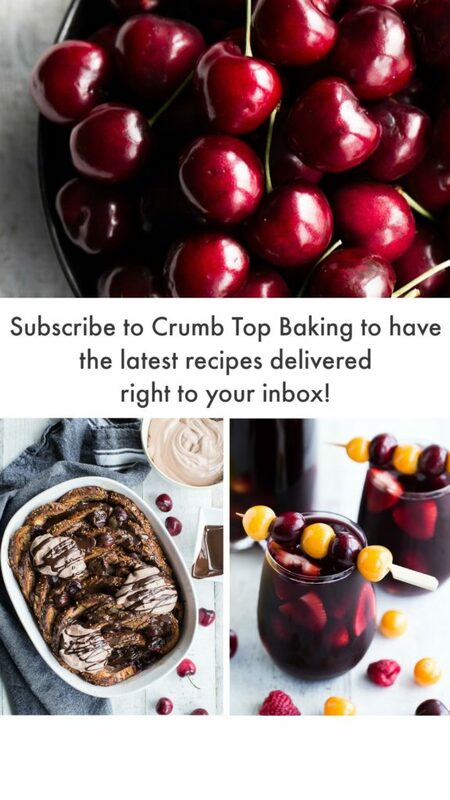 They are delicious, totally portable and only take 10 minutes to bake in the oven. I carried a small container of them around for 5 days, and the last one was just as enjoyable as the first. (Apparently, I’m not big on sharing…..I ate most of them myself 🙂 ). The pineapple, coconut and macadamia nuts give them a tropical taste and pair nicely with the vanilla from the extract and protein powder. And, of course, the bites are held together by almond butter and honey. Staples in my house! But the best part of these bites is probably the white chocolate chips. Oh, come on, you knew I had to sneak a bit of chocolate in there somewhere! I even added some optional white chocolate drizzle to the top so they can double as dessert 😉 . 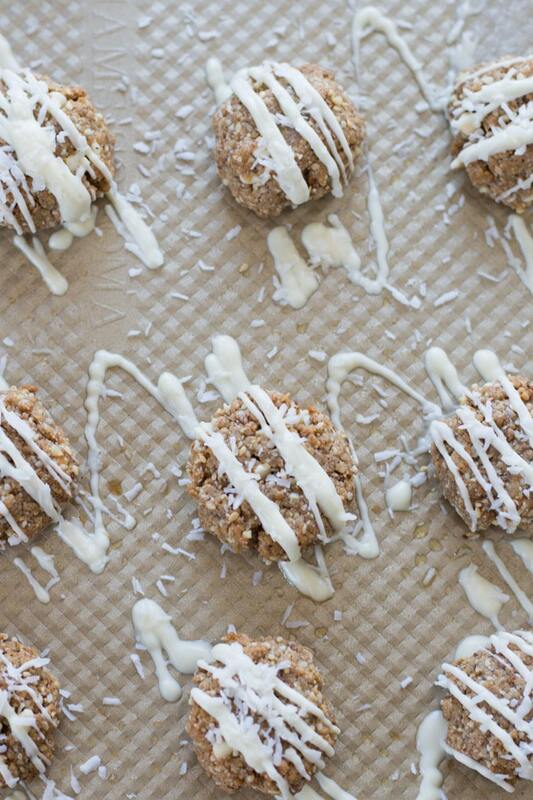 If you have a road trip or plane trip lined up for the summer, consider bringing along some of these Pineapple Coconut Energy Bites! And let me know in the comments below what other kinds of clean eating snacks you like to take on your travels! 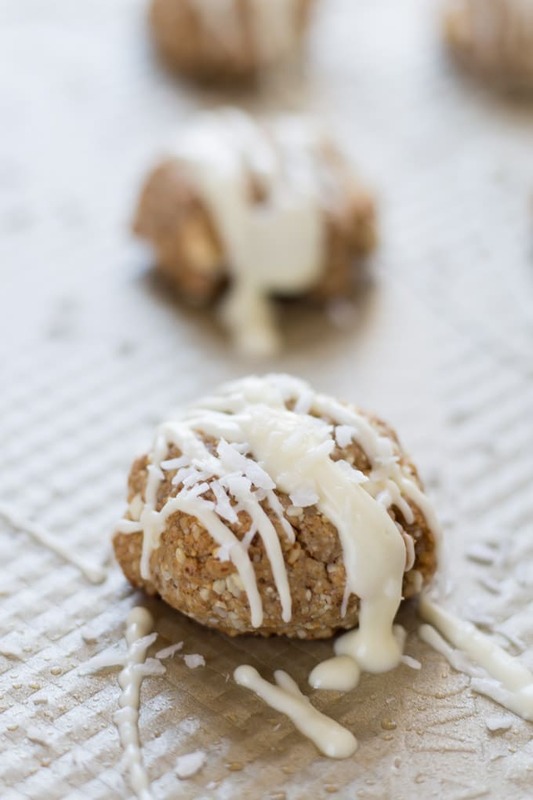 These Pineapple Coconut Energy Bites with white chocolate and macadamia nuts are perfect travel sized clean eating cookies. They are loaded with nuts and coconut and sweetened with pineapple, vanilla and honey. Enjoy these little tropical bites of energy as a snack or a light breakfast. Add the white chocolate drizzle, and you’ve got yourself dessert too! Pre-heat the oven to 325 degrees and spray a large baking sheet with cooking spray (or use a sheet of parchment paper). Add the nuts, coconut chips, pineapple, honey, almond butter, protein powder and vanilla extract to a large food processor. Process on high for 5 minutes, or until the mixture is fine and crumbly. Stir in the sesame seeds and 2 tbsp. of mini white chocolate chips. (See note below). Shape into balls and press down on the top so the energy bites resemble small mounds. The mixture should yield about 18 energy bites. Place on the baking sheet and bake for 10 minutes. Remove from the oven and let cool on the pan for 20 minutes. This will allow the cookies to firm up. For the optional chocolate drizzle, place 1/4 cup of white chocolate chips and 1/2 tbsp. of liquid coconut oil in a small microwave safe bowl and heat for 20 seconds. Remove and stir. Place in the microwave for another 20 seconds. Remove and stir until smooth. Drizzle white chocolate on cookies and sprinkle with coconut. Refrigerate until chocolate has set. Cookies may be stored in the fridge or on the counter in an airtight container for 5 days. Or freeze for later enjoyment. Depending on how hard your food processor has to work to process all the ingredients, the mixture may get a bit warm. If this is the case, wait a few minutes before you add the mini white chocolate chips as they may melt in the warm mixture. The energy bite mixture will be oily. 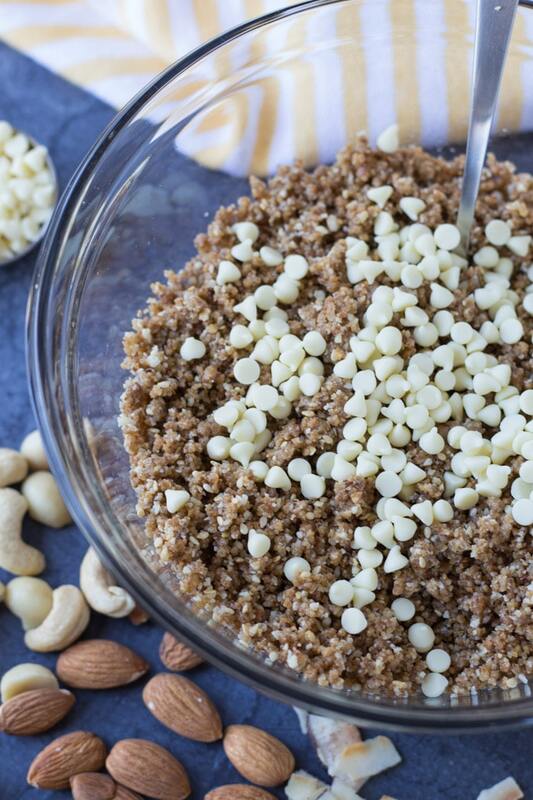 No need to be alarmed as the oil is just from the nuts and almond butter. The cookies will not feel or taste oily once baked.